Since 1996, rates of C-sections have risen 50%. While C-sections are deemed necessary for multiple reasons, some experts believe impatience, both in a clinical sense and personal sense, may play some part in the consistent rise in C-sections. According to the American Journal of Obstetrics and Gynecology, 30.5% of births in the United States are delivered by C-section. 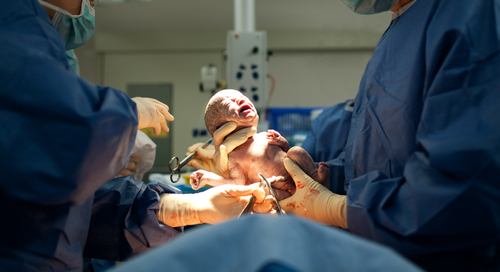 Among the common reasons for C-section include failure to progress during labor or induction, multiple fetus delivery and vaginal birth after previous C-section. Despite the relevant reasons for C-sections, there is evidence linking an increasing number of surgical deliveries to impatience. About 1/3 of new mothers give birth to a first child by C-section. Induction increases risk of C-section two fold. Half of C-section deliveries during active labor are performed when the cervix is dilated only six centimeters. What are the factors increasing the risk of C-section? Increase in number of multiple births. C-sections can cost twice as much as a vaginal birth resulting in higher out of pocket costs for patients covered under private health insurance and higher costs charged to public health insurance. C-sections also come with an increased risk of health problems and risk factors. C-sections are major surgery requiring anesthesia and significant recovery time. Uterine rupture and placental abnormalities occur more often in women who have C-sections. Source: Denise Grady. The New York Times. 30 August, 2010.